Nina Simone (1933-2003) was an American musician and activist who became an important voice of the Civil Rights Movement, and of anti-racism in the music industry. Her experiences as an artist prompted her to speak on oppression not only towards black people, but within the community; she openly addressed colorism as a dark-skinned woman who did not harbor eurocentric features, and the erasure of women like her from the media. Born Eunice Kathleen Waymon in Tryon, North Carolina, she showed prodigious musical skill at two years old. Private lessons spurred her love for classical composers and dreams of becoming a concert pianist; but Waymon was barred opportunities due to her blackness, and felt that bitterness for life. Despite monumental talent, graduating high school valedictorian, and a summer program at Julliard, she was denied acceptance to Philadelphia’s prestigious Curtis Institute of Music—a slight with which she could never reconcile. 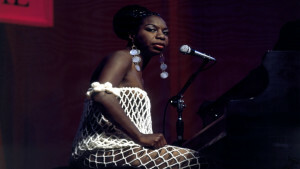 This rejection shaped the course of her career; with no further academic prospects, the musician took on nightclub gigs, adopting the alias Nina Simone to distance the “unsavory” occupation from her religious family. 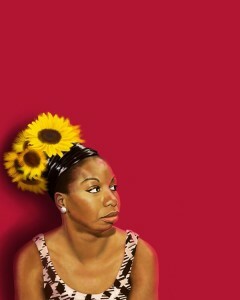 Simone became an activist in black freedom struggles. She was inspired by Black artist-activists such as Lorraine Hansberry, Langston Hughes and James Baldwin, who valued her passion and volatility; “To Be Young, Gifted, and Black“ was written for Hansberry. In March 1965, Simone performed the protest anthem “Mississippi Goddam” in Montgomery, Alabama during the march from Selma. Soon after its release in 1966, her song “Four Women” was banned from radio stations in New York and Philadelphia for being offensive to Black women. In reality, the song delineates intergenerational violence and trauma that affects Black women of all shades and circumstances. Though her unabashed anti-nonviolence stance distanced her from peacekeeping activists, she was embraced by leftist Black Power contemporaries. Facing mental health issues and disappointment with the fading movement, Simone left the U.S., returning intermittently to perform and to accept an honorary doctorate from Amherst in 1977. She died in France with a discography of over 40 albums, and continues to inspire black women artists to this day.